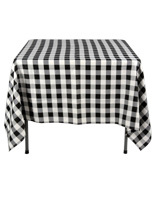 When it's time to eat outside or you want that country feel indoors, lay out a traditional picnic tablecloth. 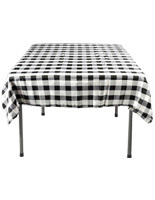 These outdoor tablecloths have the classic checkered pattern, and are made of a machine washable, wrinkle-free, flame retardent polyester. 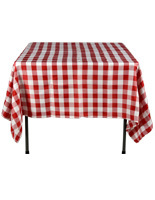 Barbecue restaurants and smokehouses commonly buy these tablecloths in bulk for high volume turnover and easy cleaning. 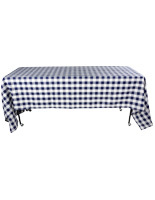 Catering companies and event planning establishments purchase these picnic tablecloths for outdoor events to throw over picnic tables or even lay out on the grass with a picnic basket nearby. 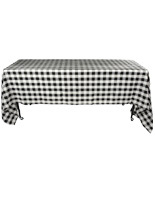 A large red and white tablecloth is perfect for a pie-eating contest, and will be easy to clean the whipped cream off at the end of the day! 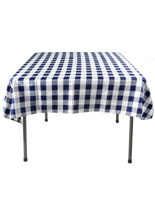 A blue and white tablecloth is a classy pattern that will look beautiful amongst the violets and tulips. Choose from a variety of sizes and table shapes for a personalized shopping experience!